Nick's work in the field of football - but, sadly, not actually on the pitch - seems to have matched the times when several Clubs enjoyed their most successful periods for some time. 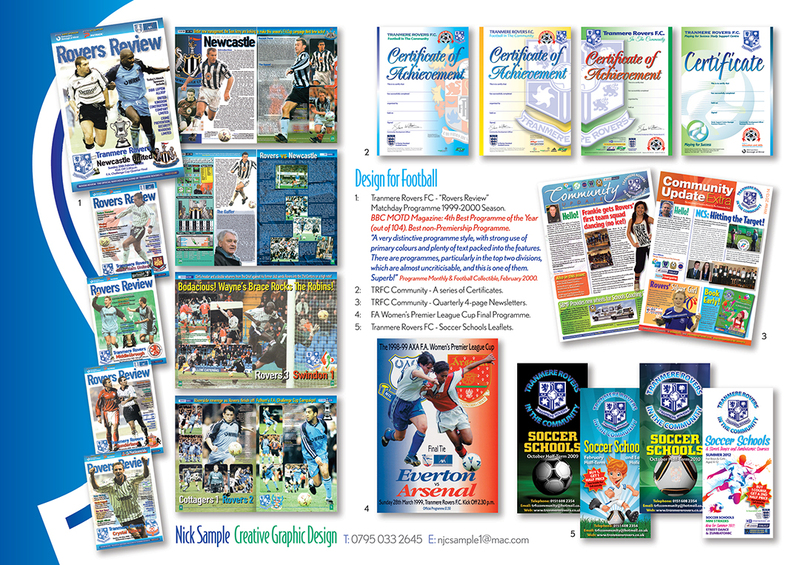 Whilst Nick was designing the matchday programme, team kits, merchandise and point-of-sale info., and all corporate and publicity material for Tranmere Rovers, between 1993-2002, they flirted with promotion to the Premiership, enjoyed killing a large number of 'giants' in some memorable F.A. and League Cup runs, and even reached (the old) Wembley for the Worthington Cup Final in 2000! Whilst designing a number of projects for Everton Football Club, including the Club's logo – the version before the 2013 re-design (which generated a 30,000 signature petition of disapproval) – they went one better by actually winning the F.A. Cup, their last trophy to date.